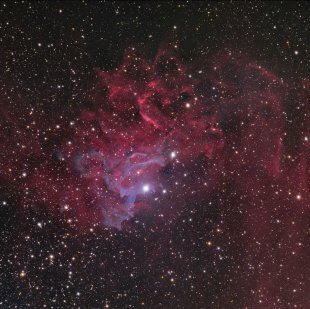 Caldwell object C31 also known as the Flaming Star Nebula is a diffuse nebula located within the constellation Auriga. Caldwell C31 is best viewed during Winter, is magnitude 6*, and can be viewed with naked eye (just barely). It is 6 in size. For reference, the full moon is 30' (arc minutes) in size.